Eking this right under the wire, I'd say......as it is the last day of the month and all. The Humanity Star isn't a star at all. It's not even human. It is a man made. I get it - and yet I don't. The Milky Way alone has about 300 BILLION stars alone. There are allegedly 100 BILLION galaxies. Assuming each has as many stars as our Milky Way, well, that's a buttload of stars. So why do the heavens need a man-made star? 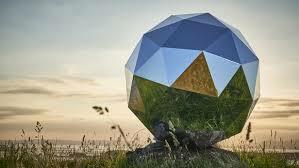 I like the idea of public art, I'm not sure I agree with it being in space. I've seen Gravity - I know what happens when space debris goes flying! Still the folks behind the Humanity star claim "it was built to reflect the sun’s light and “encourage people to consider their place in the universe". That disco ball star is covered with iridium, which makes it shiny and easy to see from earth. Parts of the International Space Station are cladded in the same material. Actually, I was able to see the ISS a few times this week in the a.m. I do like looking up and seeing things in the night time (ok, very early morning) sky, but I'm torn on this. Astronomers are not happy with this. As it whizzes by telescopes and cameras, it obscures and leaves streaks of light. While I can see both sides of the Humanity Star, push comes to shove, I see no actual reason for it. But that said, since it is already up there, I suppose I should know when it's flying overhead so I can take a gander. And at the hyperlinked site up above, if you type in your zip code, you'll know when and where you can see the Humanity Star.